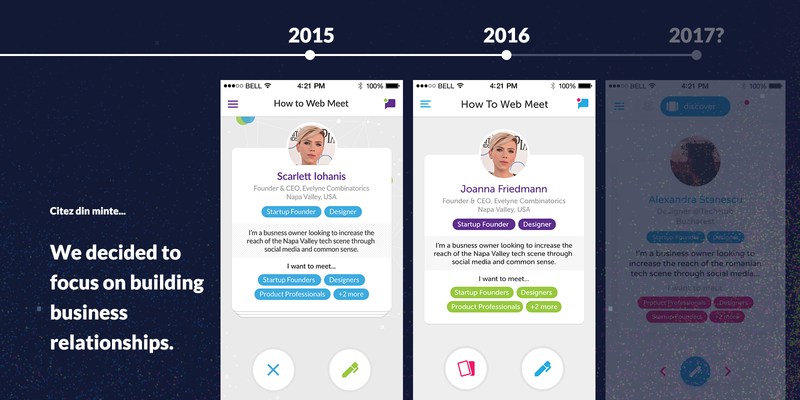 As this year’s edition is fast approaching we wish to provide a little insight into the evolution of How to Web Meet, the official How to Web Conference app and one of the most successful apps our team has created so far. 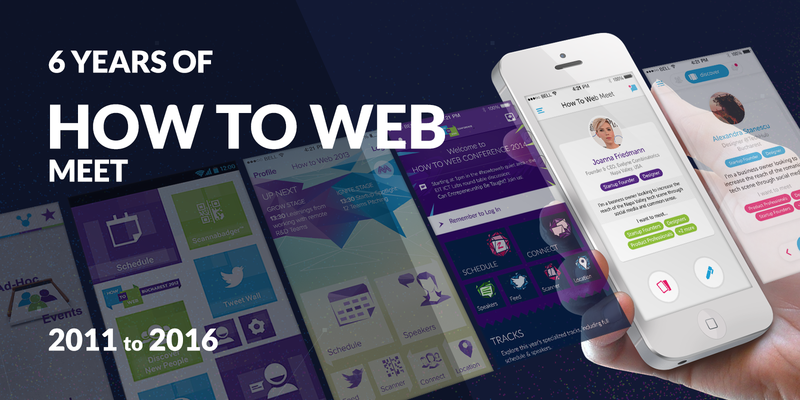 How to Web is one of the largest tech conferences in Central and Eastern Europe. Over the past few years, thousands of people have attended and have found both inspiration and business partnerships within it’s grounds. 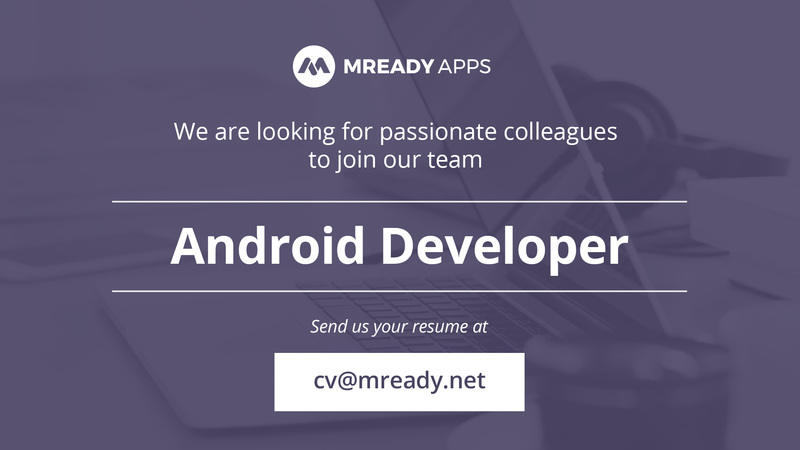 This conference app is also one of the oldest apps we’ve created here at mReady, with its first version for Android rolling out in 2011 and the first version for iPhone being available in 2012. It’s also a great example of our app design process, starting from pure UI design and moving into UX design thinking, for a more comprehensive, user-focused experience. With that in mind, let’s take a look at the problems we’ve identified over the last few years by talking to both the organizers and attendees. The conference is mainly focused on networking, creating awesome relationships between people, who then can help each other achieve what they’ve set out to do, in this case through the use of technology. We’ve broken down the issues that most people attending How to Web are facing into a few tiers. Quite a few attendees are looking to validate an idea or a product by collecting information from people who have either struggled with similar issues or who may become early adopters. Both groups hold distinctly essential information. On the one hand, early adopters can give better insights into the problems they face, the people who would want this problem solved and the beachhead market, but may offer too little in terms of actual improvements on the status-quo of doing things. On the other hand there are people who’ve tackled similar or tangential issues, who can provide advice from their own successes or failures. Another reason to attend a conference is to sell an existing product or service directly to potential customers, within a fairly specific target market. How to Web is a highly focused community of tech enthusiasts, looking for that cool new thing that may improve their experience in one area or another. Even if the personal use might not be immediately apparent, most attendees are quite open minded toward new gadgets and experiences in the hopes of improving in areas we are unaware this is an option. In close collaboration with MVP Academy and TechHub Bucharest, the conference has become an essential part of the Romanian startup scene. Hundreds of startup founders have come to How to Web to pitch their products and services to potential investors in the Startup Spotlight competition, aiming to scale their business through funding and insight from venture capital companies and angel investors. Oftentimes, participants want to get as much exposure as possible but time is limited. Talking with other attendees who may either provide us with useful insights and aid, or with people who we can in turn help, is of great value. While chit-chat is a wonderful social enabler, it’s also the lowest common denominator when it comes to communication. Nobody (as far as we know) attends conferences in the hope of having a great conversation about the weather. People come to find partners and to build relationships. There is always a good reason to meet media, PR, sales and design specialists, developers, and so on. Being a “one man (or woman) army” is a wonderful dream however in real life, we rely on each other, and teams have better chances than individuals to succeed and evolve. Since we are not robots, sometimes we forget details about the people we want to talk to. We might not remember someone’s name, where we’ve met them, or other relevant information. In the past it was common to have an assistant who would help with keeping track of all the people attending an event. The ”helper” would provide a wide range of information, starting with the person’s name and occupation, all the way to private news and what other interactions might have occurred during previous events. We can’t all afford such an extravagance but we’ve all got a smartphone in our pocket nowadays, than can easily substitute a real life assistant. Since we are constantly wondering and looking to get informed, it’s only natural to want to know more about other people attending the conference. It can be simple human curiosity, or it could be turned into a useful tool, that makes it easier to get exposure, find potential business partners and build relationships. This ties into another set of issues: having trouble finding for the “right” people to talk to and starting a conversation with them. You may have excellent interpersonal skills, and can be the most charismatic person in the room but it won’t be of any help if the people you are looking to meet are not there. One last issue we’ve uncovered on this level, derives from the desire to find the “right” business partners. The inability to schedule meetings in advance can prove to be a real drag sometimes, due to the lack of contact info between two, or more people involved. Aside from specific problems that we have discovered along the way, there is always the need to access the essential information about the conference. This may include details about speakers and their presentations, real-time updates about the event (like schedule changes) and the location with directions to the main event as well as the after party. While attending prior editions of the How To Web conference we came across the idea that something was missing. As the 2012 edition was approaching, it hit us. Maybe it needed an app that would give people information about the conference as well as a little insight into who the other attendees are. Since it was the first time we created a conference app, we also gave ourselves plenty of time to really think it through, design and develop… 4 whole days! Now, obviously, the most useful aspect of the app would have been the ability to facilitate connection between attendees… so of course we focused our efforts on the schedule and the speakers. What we did have, was a badge scanner that was able to add contacts directly to the user’s smartphone by scanning QR codes – “Scannabadger”, as we called it. It was not ideal, but it did prove to be helpful, I hear some people actually got a kick out of it. Even if we didn’t have the data to back this up at that point, we decided to have an attendee list in the app, limited to those who took the time to create accounts. Our first shot at categorising them was not based on the industry they worked in or their domain of expertise. People were able to sign up and “tell the app” if they were part of a startup, tech media, generalist media, an agency, a mature product company, an R&D center or if they were investors and these became the categories. This would give all users the possibility to see who else was attending the conference, the companies they worked with and their position at the company. More importantly, however, attendees were able to contact everyone thanks to the information they provided: Twitter handle, LinkedIn profile and email address. Of course, we did not make everyone’s email address publically available but rather created a system that would allow users to compose a message within the app that we would then send to it’s intended recipient. Searching for attendees by name was also possible with the app. By 2015 we were starting to get a general idea of what attendees are looking for when attending a conference and we were quite happy to hear that we mostly got it right. After a meeting with the How To Web organizers we decided to change the focus of the app towards networking, away from simply providing information. Tinder was quite popular at the time. Everyone and their mother wanted to make apps with a left-right swiping mechanic. They started cropping up on user interfaces for any form of choice so we figured it would be an interesting, familiar way of interacting that people would enjoy seeing more of. Well, that and we also thought that “It’s like Tinder for conferences” would be an amusingly accurate description of what it did. Now while a user could get quite a bit of exposure by appearing in the lists of all the other attendees at the conference, it would not guarantee the most “matches” would actually be relevant. To provide people with both exposure and potentially relevant networking opportunities, we also created a fairly simple matchmaking system. In addition to their personal information, each attendee has the option to provide us with insight into who they are looking for and in return they would be offered suggestions according to their personal wants and needs. So you found someone who you think you want to talk to? 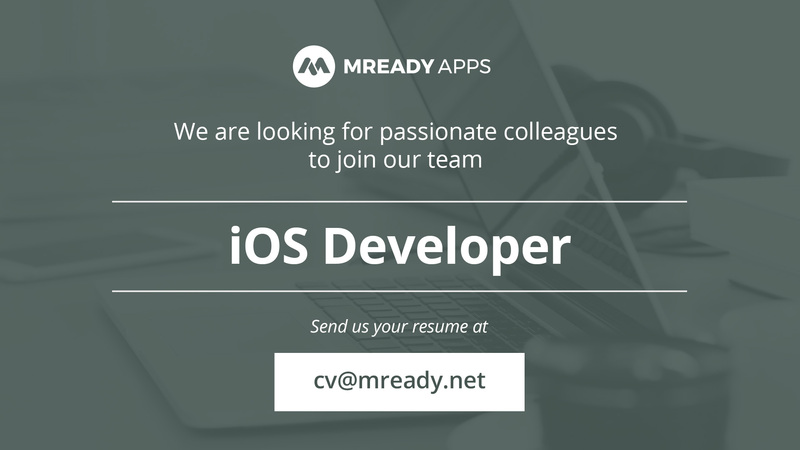 Now you can see their Linkedin profile, provided they added it, as well as more info on professional persona. 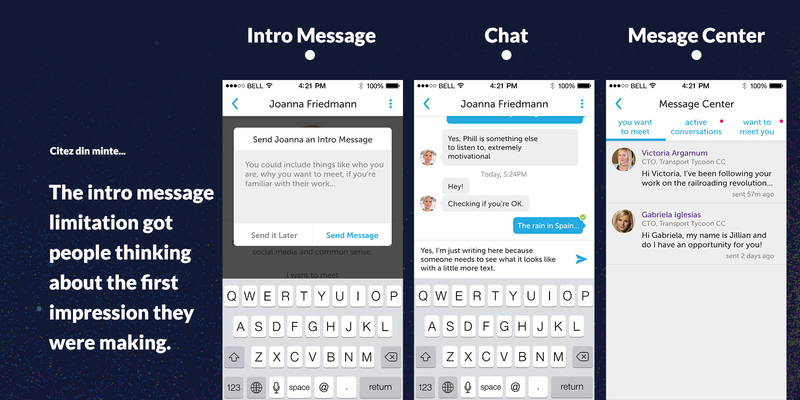 Once you’re ready to talk to them and you know what you want to approach them about, you can chat with them directly in the app… but we don’t want anyone to get spammed with messages from the same person so we brought in the concept of the “intro message”. Instead of the usual “Hi!” people were actually take time to compose their message, since this was their only chance at making an impression. On average, the time spent composing an intro message within the app, during the conference, was about a minute. For this version we kept the browse attendees options, with categories and lists and updated the categories to better fit user requests. Since the networking part of the app is now the focus, other information about the event was moved slightly out of sight. We found that people were quite interested in using a networking app. About 45% of over 660 total app users, have downloaded and were using it three days before the conference. Another 35% joined them the following day, probably thanks to the email reminders they received. The last spike in downloads was noticed after the Welcome Speech from the conference’s CEO. Funnily enough, 4 users had downloaded the app and added their account info after the conference had ended. We weren’t able to contact them and ask for their reasons, since we don’t collect any personal data about the app’s users. If you’re into engagement statistics, the app had about 21000 screen views during the conference, around 10000 views in the 2 days leading up to the event and another 13500 views in the 2 weeks before that. The average session length was higher during the 2 weeks prior to the conference, at about 16min 30sec. But then dropped off significantly on the 2 days before the event, to about 9min and then rose up during the conference to 11min 30sec. Obviously, people were doing a lot more than just opening and closing the app. About 70 to 80% of the in-app time was spent browsing through or talking to other attendees and the remaining 20-30% looking over the agenda, event details, speakers and location details. 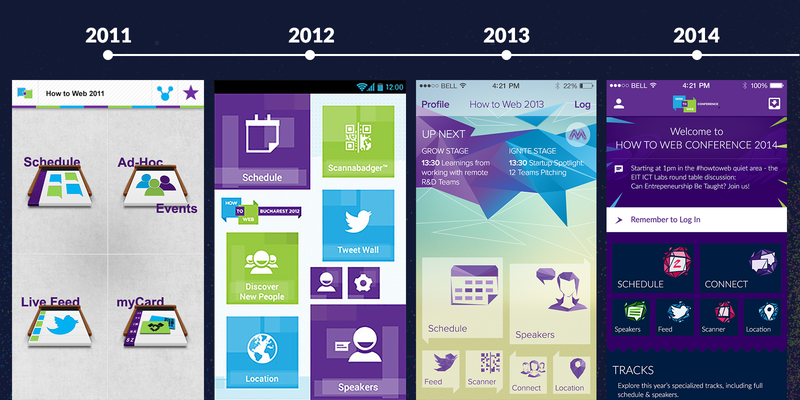 We’ve also found that the app was used quite frequently before the conference, especially 2-3 days before. What we’ve seen both from the numbers and from talking to people is that most attendees were using the app to set up meetings before actually arriving at the conference. The use of the other app features was fairly limited, since there was no real need for that. The general behavior within the app was consistent with the numbers. People were mostly circling between the card recommendations, the message center and chat, occasionally dropping out of the loop to look at the agenda. If you’re curious about how often people would find someone relevant with the app, the number was a fairly steady 6.60% – 6.80% of the time. That means that 1 in 15 people from the ones who appeared in the suggestions would be considered relevant. The percentage itself seems pretty low but considering that we’ve managed to facilitate over 1500 potentially relevant connections through the app , we are quite happy with the result. Some other fun facts: 15 users swiped through all the attendees in the app, during the conference, that means over 660 people. Even more so, one of them swiped through all the attendees twice! That’s commitment! Overall, users’ behaviour was pretty much what we expected. The matchmaking, message center and chat systems were working quite well and got most of the attention, somewhere around 70-80% of in-app time, as mentioned before. Integration of the app within the conference through media and word of mouth went very well. The How to Web team did a fantastic job bringing the app to the attendee’s attention through emails, their blog and by promoting it onstage as a key networking tool for the conference. We got to facilitate over 1500 potentially awesome business relationships. These were connections between people who knew fairly well how both parties would benefit from the discussion. The card system of matchmaking was both a great hook for using the app as well as a useful tool for networking, given that is was frequently used. We were expecting people to search the categories more than they did, but we’re glad to see that the key new feature worked out so well. Based on the feedback we received it was easier for attendees to connect with each other on a stronger level thanks to the profile information provided, thus the relevance of connections created through the app seems to have been high. This statement is an inference so take it with a grain of salt. Turns out that the automatic login system, via deep link sent within an email is a great way of skipping the old email and password method. Nevertheless, we kept the standard login, just in case. The push notification system for conference news and announcements was received well, it proved to be quite helpful. We encountered a problem while creating user profiles. A few accounts were missing and we’re not sure why this happened. Fortunately, people were eager to use the app and they approached the organizers about this issue, which we’ve managed to fix quickly enough. Another thing that we really fucked up was the location of the parties. Double and triple checking this particular feature is now standard practice when we’re making a conference app. It has also become a running joke around the office. Some users did not have access to an important app feature, which allowed searching for specific people, thus being limited only to browsing profile cards. This problem has been resolved for the 2016 version and is now working as intended. While the average time people spent in the app was about 12 minutes, the chat system would be used in bursts of only 1min – 1min 45sec. Turns out that most people would usually have a quick chat in the app and either set up a meeting for later or meet face-to-face right away. The day before the conference, around 70% of the users had already installed the app. As it turns out, attendees are interested in using a networking app at a conference, and they will install it and set up their profiles days and even weeks before the conference. It came as a surprise for us to see that attendees were setting up meetings days before of the conference. Proper marketing of the app is essential. Emails, newsletters, blog posts and mentions on social media services have contributed to roughly 70% of the app users to install and use it. Reminding people about the app during the How to Web welcome speech and word of mouth would most likely account for the other 30%. With only one chance at making an impression, people tend to avoid excessively simple introductions like “Hi!”, or “S’up?” or smiley faces. They usually took around a minute to compose this message. This is a list with things that are mostly ”nice to have”s. The first one we’ve noticed is that adding a meeting to the user’s calendar directly from the chat screen may prove to be useful. It has been requested by some of organizers from other conferences we’re in contact with. Likewise, having the option to add specific talks or presentations to one’s calendar might be useful. Sponsor messages from the event’s partners can be integrated into the push notifications and the messaging system and would certainly make some companies happy. Another feature that was brought to the table is the option to collect questions from the crowd directly through the app. An easy version of this can be achieved by using special hashtags on Twitter and it seems to be working well enough. For those events that are a mix between a conference and a fair, a section dedicated to showcasing exhibitors might be useful. This could go hand in hand with a conference map, but then again, this is a requirement on a case by case basis. And one last things that may seem insignificant, but can have a positive outcome is a ”happening now” feature. To be honest, we’re still exploring the impact of some of these features on the user experience, but they seem, as mentioned before, nice-to-haves, that do some provide value, but are neither mandatory nor “should have”s. It’s been an interesting 6 years, we’ve faced quite a few challenges, got to learn a great deal from the experience and hope to keep learning about the intricacies conference and the wonderful people attending How to Web for at least 6 more years. If you need help with a mobile project, let us know by either completing the form on our website or by sending us an email at [email protected]. And if you want to talk about human centered design, UX design in general or gamification (as human focused design rather then a collection of PBLs), hit me up at [email protected].